India says it will consider all options "to protect its territorial integrity"
NEW DELHI, India (CNN) -- U.S. Secretary of State Condoleezza Rice called on Pakistan Wednesday to take responsibility for terrorists that are operating within its borders, terrorists India accuses of masterminding last week's attacks on Mumbai. 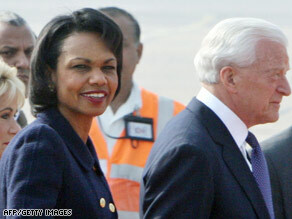 U.S. Secretary of State Condoleezza Rice arrives at New Delhi's Air Force station on Wednesday. "We believe Pakistan has a central role to play in this, to make certain that these terrorists cannot continue to operate and operate in this fashion," Rice said at a joint news conference with her Indian counterpart in New Delhi. While stressing that the investigation into who is behind last week's terrorist siege is still ongoing, she took issue with Pakistani President Asif Ali Zardari's assertion in a CNN interview that Pakistan had no role in the attack which he said was carried out by "stateless actors." "Non-state actors sometimes operate within the confines a state ... and when that is the case, there has to be very direct and tough action against them," Rice said. "Non-state actors, that's still a matter of responsibility if in fact it somehow relates to your territory." Indian investigators say the lone surviving suspect in last week's attack has told them he is a Pakistani, as were the the other gunmen. The attacks last week killed at least 179 people, including six Americans. Rice is in New Delhi to try to ease tensions between India and Pakistan, both nuclear powers and key allies of the United States. She will head to Islamabad on Thursday. "So far as (the) government of India is concerned, what action will be taken by government will depend on the response we have from Pakistan authorities," Mukherjee said. India recently renewed its demand that Pakistan arrest the suspected Islamic militant leaders, who have been on India's most wanted list for some time. New Delhi believes the group -- which includes the leader of the al Qaeda-linked terror group Lashkar-e-Tayyiba -- helped plot last week's attacks on Mumbai. Rice warned India that "any response needs to be judged by its effectiveness in prevention, and also by not creating other unintended consequences or difficulties." "We are going to work very closely over this time, and as I said, we are focused with India on both bringing the perpetrators to justice and on preventing further attacks."